On a warm Saturday in May, I joined some friends for eats on the beautiful street that is Elizabeth. Following a small plate binge that is otherwise known as Dim Sum, we decided to do more damage and get ice cream. 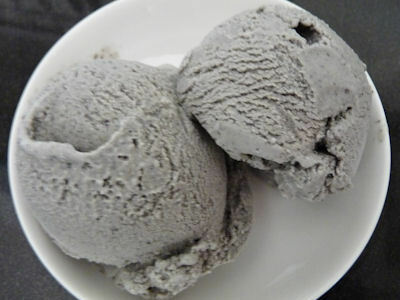 A friend who I discovered to be a real foodie, recommended the Chinatown Ice Cream Factory. My eyes lit up with excitement as it had come highly recommended by my boss at work. A short stroll away, we were greeted by quintessential Chinatown storefront characteristics: a small hole-in-the wall sort of place that wasn’t trying too hard or calling any attention to itself, except for the overwhelming number of people lined up outside. In addition to your standard range of flavors, a flamboyant selection of other varities like avocado, lychee, taro, wasabi and black sesame, kept me excited. The latter, left me floating in a creamy universe that wasn’t too sweet, allowing the buttery experience to lend itself to complete foreign territory in ice cream experience. What I love most about this flavor, is it harks back to a unique and authentic taste, catapulting beyond the plain Jane vanilla. The ice cream had such a pure sesame base (think Tahini, essentially sesame seed paste, a Middle Eastern staple) and finished so well with just the right amount of sugar and cream. July 2010 will witness the debut of Bang, the inaugural fragrance for men by Marc Jacobs. I’m already thinking this is quite noteworthy, as spicy pepper is the fragrance’s top note and a favorite essence of mine. Simple yet packing quite the punch, Bang is bound to generate a lot of buzz. Beyond the astuteness of the scent’s nomenclature, the designer himself is the face of the fragrance, bringing a different element to the Marc Jacobs brand as we know it. Following the footsteps of Yves Saint Laurent who posed naked yet quite placidly for his Pour Homme fragrance, Marc Jacobs is literally and metaphorically penetrating the sexual context. Reminiscent of Tom Ford’s overtly sexual messaging, Bang takes on a visual and textural guise as Jacobs’ crotch area exposes a metallic structure that seems like it has just experienced a powerful blow, pushing the contours of the bottle’s perspective into a punch that’s been captured quite baroquely. Accordingly, Jacobs facial expression suggests the cause of the structure’s state. Sources have stated that the campaign will be modified for more conservative markets like the Midwest and the Middle East alike. 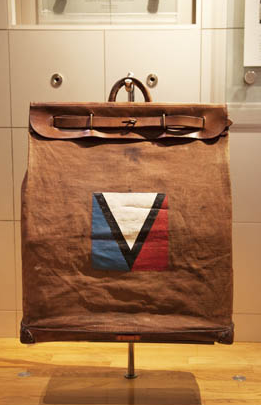 For more than 150 years Louis Vuitton has been crafting a heritage of luxury, a cachet that extends beyond the veneer that is the LV monogram and its cult of the rich and parvenu. Positioning itself as relevant to the times (fashionable), classic and everlasting, Louis Vuitton has been quite instrumental in asserting its credibility not only in luxury, but culture and the cosmopolitan. Think to the celebrated series of city guides illustrated by Ruben Toledo. In tandem, the Journeys campaign (created by Ogilvy and Mather), which most notably features some of the brand’s A-list celebrity ambassadors basking in the glory that is Annie Leibovitz’s photography, has also been proven to be quite accomplishing—another testament to the brand’s globe trotting heritage. 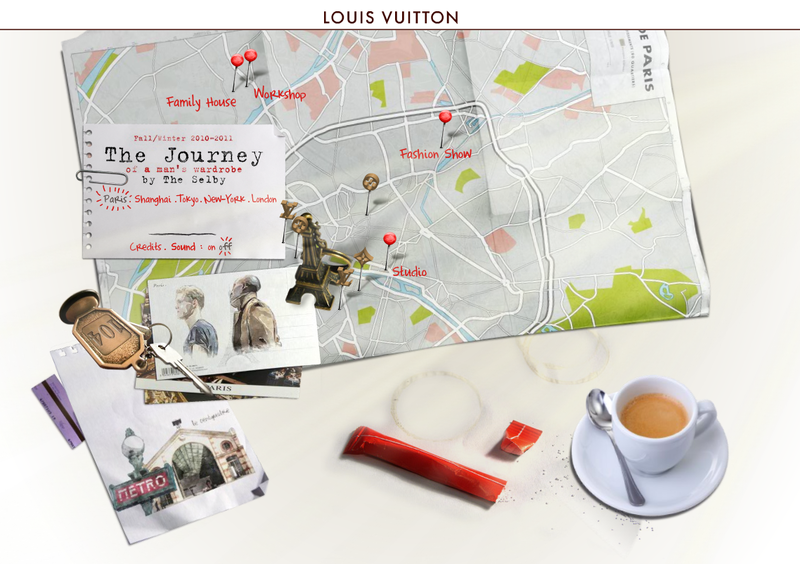 Partnering with Todd Selby, the acclaimed photographer and illustrator, Louis Vuitton’s latest campaign, Journey of a Man’s Wardrobe, takes this peregrinating romance a little further, by capturing the lives of notable artists, hoteliers and their respective destinations in an all encompassing interactive site. Brimming with illustration, sound and beautiful photography, The Journey of a Man’s Wardrobe, documents the lives of individuals in their artistic and geographical elements. From Paris, to Shanghai, to New York, you enter homes, offices and studios. Personal and Louis Vuitton pieces are captured, as retro meets contemporary and nuances on Fall 2010 are denoted. What’s most enthralling is the variety and difference encountered as one experiences these unique spaces and characters. It’s not all rustic and old world (visit Tokyo and you’ll see what I mean), yet the underlying yet subliminal message remains. 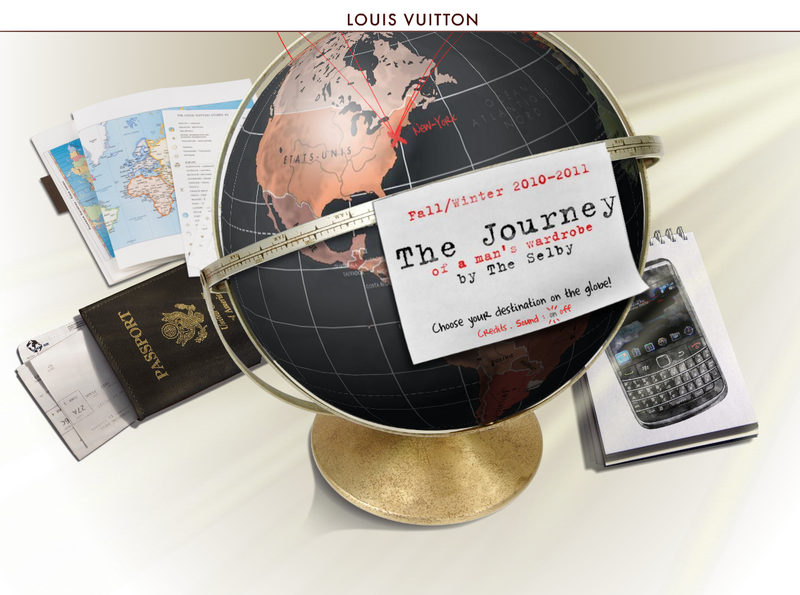 That is, Louis Vuitton’s presence is hardly for the whole world but certain, discerning individuals, from the world over. 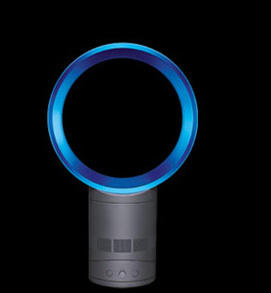 What Dyson has done to vacuums is taking the very same place with fans, or to put more astutely Air Multiplier™ fans. Unconventional, Dyson’s latest invention takes air in and intensifies it 15 times, creating a fluid stream of air. No blades, no grill, it’s safe and easy to clean. Although it falls in the $300 range, this is the coolest a fan has ever gotten. No doubt, it will become quite the conversation piece at your next summer cocktail party. Brace yourself New York, All Saints Spitalfields is extending beyond it’s Bloomingdale’s offerings on 59th. Amidst the fashion mecca that encompasses Topshop and Uniqlo, the new SoHo store is set to open on May 20th. 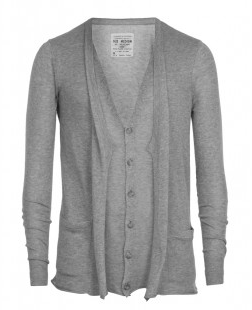 Described as Romantic Goth, the style is very much noir and edgier than your standard. With a combination of high-end threads (their knit wear is simply phenomenal), amazing craftsmanship, and an aesthetic that has quite the conviction (think desert melancholy in a manner that’s effortless and chic), the store should do more than well. The UK line has already established itself in Boston, L.A., Miami and the new SoHo store is bound to ooh and ah. Letter presses, sewing machines and a ram skull insignia make up for the All Saints canvas and one can only imagine the potential unleashed with SoHo exposed brick, hard wood floors and the industrial heritage the neighborhood possesses. What is most striking about All Saints is that they scream high street without actually screaming. 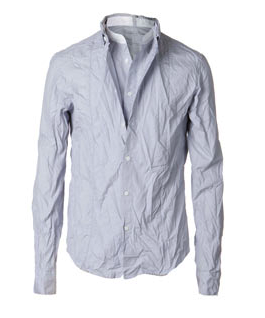 Rather, the line is described as understated luxury that stems from quality and a slimmer silhouette and not necessarily from vibrant colors or patterns, thus allowing you to incorporate into your daily uniform, be that professional or casual. These days, I’ve become enthralled with the world of wardrobes, stylists, costume designers etc. Indifferently tagging along to Iron Man 2, I left the movie, unexpectedly excited. The flick was light, comical and for the most part enjoyable. I hadn’t seen the first movie and so I wasn’t sure what to expect. Nonetheless, there was some relevance that was to be reserved, nostalgically speaking that is. My brother whose love for Iron Man or Al Rajul Al Hadidee, goes way back to our childhood when we would watch the animated cartoon dubbed in Arabic. Putting the action, special effects and the apparent, much slimmer, fitted Iron Man suit aside, I want to comment on wardrobe. Duly noted eye candy, came from Stark, Hammer and Pepper Potts. In a scene of disgruntled exchange between Stark and the newly appointed CEO, Potts, both characters exude sartorial elegance at its finest. Stark layering a sophisticated graphite blazer with jeans and either cons or plimsolls, I couldn’t tell and Potts, in the most simple, but razor-edged grey dress with heels that only a CEO could afford. Balancing this highlighted spectacle was a sun drenched scene with an office that boasted expansive windows, freshly cut calla lilies, a stainless steel artistic contraption and the dismal strawberries that Potts was allergic to. Hammer’s character, regardless of how obnoxious and ill intentioned, was also sartorially preeminent. Always in formal wear, his three piece suits, vests and picture frame glasses could only allude to his impeccable taste, adding dimension to his character, making him look great even in his most humiliating and awkward moments. Major kudos goes to Mary Zophres, the movie’s costume designer. Authentic and affordable, Da Andrea is one of very few Italian restaurants that’s undisputedly rustic. Charm transcends the space’s exposed brick and cozy feel, as the experience is complemented with homemade pastas and low-priced house wine. The carpaccio was some of the best I’ve had in a while, paired very well with arugula that was dressed in simple olive oil and acid, parmesan and hearts of palm. Following that, was the homemade Cavatelli with pesto, shrimp and salmon. The pesto steered clear from being too oily and the seafood was fresh and very well seasoned.